SPORTSMEN and women at the University of Warwick are hoping to make it 27 years undefeated as they take on Coventry University in the hotly-contested inter-university games. Sports clubs at the two university’s will go head-to-head in the 2017 Coventry Varsity games next month, with only one university being named winner of the tournament. The University of Warwick currently boasts 26 years undefeated and are hoping they can retain their unbeaten record in this year’s 27th annual games. 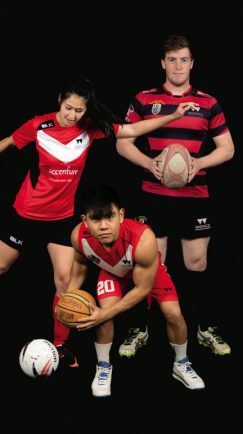 Every year in the two university’s compete against one another in over 20 different sports including football, rugby, tennis, athletics, netball, swimming, ice hockey and even snooker, in 34 fixtures across nine days. Newly added for 2017 is Taekwondo, with both Coventry and Warwick having strong teams. For every match won, points are awarded, and the university with the most points overall takes home the Varsity crown. Ted Crowson, Sports Officer, Warwick Student Union said: “We are fortunate to have so many people at the University who – besides completing a full time degree, teaching or working – devote themselves to competing and supporting the wide-range of sports who epitomize the character and success of The University of Warwick each time they put on the red and black colours, not only each week, but for the special occasion of Varsity. “Varsity is our biggest sporting event of the year and for far more than just the sports clubs and students, it’s an experience we want you all to share with us. “Be the person who scores that goal, attends the most fixtures and cheers the loudest when we win – be the difference. Since its inception in 1990 games have become increasingly competitive but so far the University of Warwick has always brought the glory home. This year’s Varsity finale will see university rugby teams take center stage at the Ricoh Arena, directly after the Aviva Premiership game between Wasps and Gloucester Rugby teams. Lisa Dodd-Mayne, director of sport and active communities at the University of Warwick said: “The Finale Events give students a unique experience to play in front of crowds of thousands of people from both university’s, an opportunity which is the pinnacle of many of our students university sporting careers. “Varsity provides a unique experience for our students, both for those who compete, and those who spectate. It provides an opportunity for them to come together as one team, with the excitement spreading across campus as the event nears. “I’d like to wish everyone competing in Varsity the best of luck. The ice hockey will open the event at Planet Ice while the rugby match will provide the closing at the Ricoh Areana, with tickets available to the general public at a reasonable price. All other events taking place across both universities are entirely free for spectators to come and enjoy. Visit varsity.warwicksu.com for tickets and information about 2017 fixtures and results from past competitions.